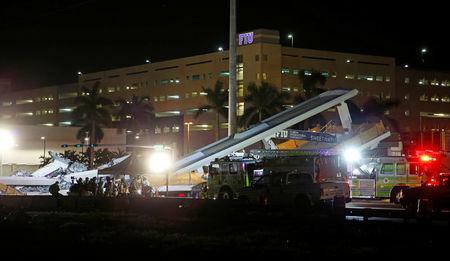 MIAMI (Reuters) - A U.S. senator demanded documents on Friday related to the construction of a new footbridge in Miami that collapsed a day earlier and killed at least six people, as federal and local investigators worked to determine the cause of the tragedy. In a letter, Senator Bill Nelson of Florida asked the U.S. Department of Transportation to turn over all records related to the engineering, design, construction, safety and inspection of the project, which spanned a major road next to the campus of Florida International University (FIU). "If anyone dropped the ball and it contributed to this tragedy, then they should be held accountable," Nelson, the ranking member of the Senate Committee on Commerce, Science & Transportation, wrote to the department. Police have said more bodies may be recovered from under the rubble after the 950-ton, $14.2 million bridge plummeted onto traffic on one of the busiest thoroughfares in South Florida on Thursday, crushing vehicles trapped underneath. "We know that there's people missing, the family members know that there's people missing, and what we can tell them is that we can assume that they're in there," Juan Perez, director of the Miami-Dade Police Department, said at a news conference. The victims have not been named, but at least one was a female student at Florida International University, officials said. News reports saying that engineers may have been conducting a stress test that might have led to the collapse could not be confirmed, officials said. It was too early to say whether anyone might face criminal charges, Perez said. The 174-foot-long (53-meter-long) bridge connected FIU with the city of Sweetwater and was installed on Saturday in just six hours, according to a report posted on the public research university's website. Florida Governor Rick Scott's office has said that a company contracted to inspect the bridge was not pre-qualified by the state. "If anybody has done anything wrong, we will hold them accountable," Scott said late on Thursday. National Transportation Safety Board officials were on the scene on Friday to investigate. Munilla Construction Management (MCM), which installed the bridge, said it was devastated by what happened, was cooperating with investigators, and doing everything it could to help. The Miami-based company, which also has operations in Texas and Panama, employs about 500 people and specializes in civil projects, airports and educational facilities. Since being founded in 1983, it has handled billions of dollars worth of projects in Panama, Florida and the U.S. Southeast. A spokeswoman for Miami-Dade County Public Schools said by phone that MCM had been doing high-quality work for the district for more than 20 years, but noted that the FIU bridge project was different. "You can't really compare them," said the spokeswoman, Daisy Gonzalez-Diego, adding that all contractors are evaluated on an ongoing basis by district staff. MCM appears to have the backing of Miami-Dade County to build a planned $800 million bridge between Miami and Miami Beach, including receiving the county's support in a lawsuit seeking to block Florida officials from awarding it to a competitor. According to campaign finance reports, the company and the five brothers who own it give generously to candidates at the local, state and federal level. MCM officials did not respond to requests for further comment on Friday. To limit disruption to traffic, the 174-foot portion of the bridge was built using a method called Accelerated Bridge Construction before being driven into its position over the road using a rig. An attorney who represented the designer, builder, and general contractor that worked on a parking garage for Miami Dade College that collapsed in 2012, killing four people, said Thursday's bridge collapse may make some developers rethink the cast concrete method that was used. "That's a type of technology that's widely used, but any time that you have an event like this, a collapse that nobody would ever expect to happen, it's going to make people think twice about the methods," said Spencer Mallard, chair of Miami law firm Lydecker Diaz's construction group. Mallard said it could be days or weeks before the public hears anything from the contractor beyond the brief statement issued yesterday. "It's going to take a lot of time to investigate and determine what really happened," Mallard said.